A Lesson for the Teacher is the autobiographical journey of a man from a Jewish family, raised with mixed and often confusing views about faith and life. As he stumbles his way into teaching, and into the hands of God, the door is opened for him to learn the greatest lesson of all, from the greatest teacher of all-Jesus. A serious medical diagnosis, and a zeal for music and Bob Dylan become additional vehicles that move the story, through humorous and sorrowful times to its revelation of the Lord's wonderful plan for our lives. Jay Heisler was born and raised in New York's Bronx, where he earned his Masters in Education from Lehman College. After college he moved to Florida, where he teaches special needs children. Jay plays guitar for pleasure, worship, and as a teaching tool to help reach and stimulate his students through rhythmic movement and audio focus. 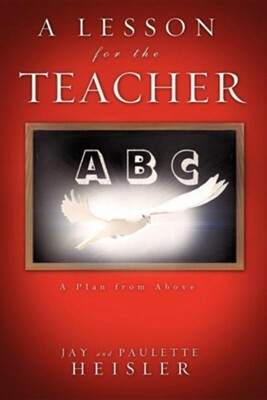 Having spoken his testimony about the Lord to friends and family, he now feels the need to reach out and share his experience with as many as possible, in his first co-authored literary work: A Lesson for the Teacher. Paulette Heisler grew up in California where she became interested in art and design at an early age. She paints and designs, and volunteers her talents to faith-based organizations. Extensive travel has given her an interest in many cultures, which she incorporates into her designs, cooking, and decorating. I'm the author/artist and I want to review A Lesson for the Teacher.